Tea is considered to have originated in China. But it’s the delicate, fresh-tasting green tea that became popular in Eastern society and is still the base of tea culture there today. As tea culture spread and tea was processed for export to trade beyond regions, neighboring countries and eventually across oceans, it was discovered that the more oxidized black tea would retain its freshness and flavor better over long journeys than its minimally oxidized green tea cousin. In the earliest days of border trade between China, Tibet and other neighboring countries, tea was fermented, dried and pressed into bricks to be used as currency. To this day, most of the black tea produced in China is exported out of the country. The Dutch first brought tea to Europe in 1610, it arrived in England in 1658, and then it rose in popularity in England’s American colonies throughout the 1700s. Demand for tea experienced huge leaps in the 1700s as England expanded sugar imports from its Caribbean colonies. By 1800, the English were annually consuming 2½ pounds of tea and 17 pounds of sugar per capita. Some claim it was the increasing trend of adding sugar to tea that spiked the demand for strong black tea over the more delicate green tea imports. The next leap in black tea production came in the 1800s when the Camellia sinensis assamica tea plant variety was discovered in 1823 in the Assam region of India. This native variety was much better suited to the production of the hearty, bold black teas that were in high demand. Not long after, in 1835, the English started planting tea gardens in India’s Darjeeling region, near Nepal. Since India was a British colony, these different varieties of black teas quickly became popular exports to England. Orthodox: In this more time-consuming method of production, tea leaves remain whole or only partially broken during processing. Tea leaves are plucked from the garden, withered to reduce moisture, rolled in a variety of ways to bruise the leaves and start oxidation, oxidized to create color and flavor, fired to apply the heat that stops oxidation, and then graded for quality. Non-Orthodox or CTC (Crush-Tear-Curl): In this sped-up version of the production process, the tea leaves are cut into fine pieces instead of rolled. The smaller pieces of leaves are more quickly oxidized, producing a one-dimensional, consistent, strong and bold black tea. The cut pieces also easily fit into commercial tea bags, which are more popular with end consumers than loose leaf tea. Our black tea is rolled immediately after withering to help get the oxidation processes started quickly. The leaves are then fully oxidized before they are dried, which is how they get their dark color and rich flavor. For more information about the different types of tea processing, visit our “How is Tea Made?” page. India’s Assam region is the largest tea-growing region in the world. The rainy, tropical climate produces a tea known for its bold and malty characteristics that stand up well to milk and sugar. Grown in a smaller, mountainous tea-producing region of India, Darjeeling is a softer, more herbaceous black tea that can change season to season with the climate. 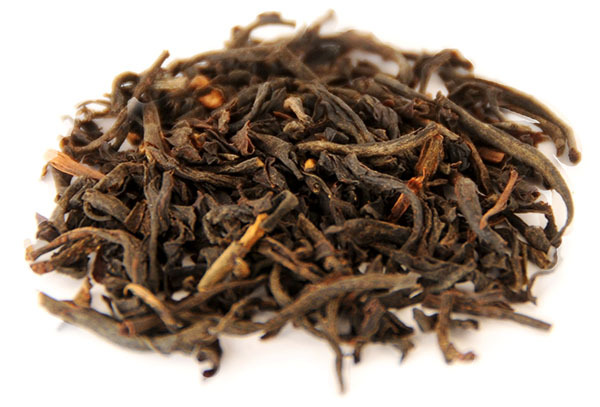 Darjeeling is often used as the tea base for India’s popular spiced beverage, Chai. Being a latecomer to tea production (early 1900s), Kenya learned fast and now leads Africa and the industry in the CTC style of tea production, producing and exporting mostly black tea. Kenyan tea is known for its assertive, full-bodied style. While not a top-producing tea region of the world, the Tetulia region of Northern Bangladesh is home to (and namesake of) Teatulia®’s own USDA-certified organic tea garden. At nearly 2,000 acres, we’re proud that our tea garden is one of the largest of its kind in the world. We cultivate the Camellia sinensis assamica tea plant variety using natural farming methods that don’t harm the environment. And we use the orthodox method to process our black tea, so the fully oxidized leaf stays whole and brews into a fresh, sweet liquor with notes of apricot and honey. To learn more about Teatulia’s black tea, visit our black tea product page. The Western palate has certainly become used to typical strong black tea that can stand up to sweetener and cream or lots of ice. So for a long time, the quality and variety of black tea wasn’t something that was highly regarded in the West. Mass production to meet the demand for tea was more important. But as consumers learn more about the world of tea, demand for premium, artisan, loose leaf teas are on the rise, and variety, freshness and flavor have become important distinguishing factors in choosing which black tea to sip. When choosing a black tea to sip, remember that not all black teas taste the same. Just like with fine wine, there are so many variables that give individual black teas their own particular flavor profiles, including where it was grown, if it grew near other crops that affected its flavor (e.g. rose bushes or coffee plants), what kind of climate it grew in, if it was fertilized naturally or with chemicals, how long the leaves were allowed to oxidize when processed, what kind of heat treatment the leaves received to stop oxidization, and whether the leaves were left whole (orthodox) or cut into smaller pieces (non-orthodox) for packaging. Generally, black tea is stronger, bolder and richer than green tea. A brewed black tea can range in color from amber to red to dark brown, and its flavor profile can range from savory to sweet, depending on how long it was oxidized and how it was it was heat processed. Black tea typically has more astringency and bitterness than green tea, but if brewed correctly it should be smooth and flavorful. Some common traits used to describe the overall flavor profile of the black tea category include malty, smoky, brisk, earthy, spiced, nutty, metallic, citrus, caramel, leather, fruity, sweet and honey. 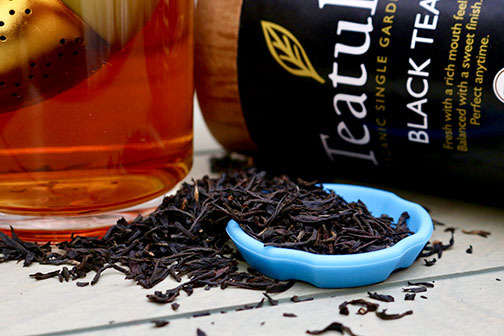 To get an idea of the specific flavor profile of Teatulia’s black tea, visit our black tea product page. To ensure you’re getting the freshest black tea you can sip, be sure and buy it from a reputable company that can tell you when and how the tea was processed and packaged. While it won’t really go “bad”, tea can get stale if it sits around too long. Oxidized black tea is more shelf stable than its delicate green tea cousin. Many black teas can last up to one to two years if stored properly in a cool, dark place and in an opaque, airtight container away from light, moisture and pantry items like coffee and spices that can leach flavor into the tea leaves. For more information about how to best care for your tea, visit our “How to Store Tea” page. Use fresh, pure, cold filtered water. Spring water is the best. Black teas are typically brewed for longer periods of time and in hotter temperatures than green teas. Generally, this is somewhere between 200 and 212 degrees for 3 to 5 minutes. If you don’t have an electric kettle with temperature control, just remember that at sea level water simmers at 190 degrees and boils at 212 degrees. The boiling temperature drops about a degree for every 100 feet in altitude increase. So, generally, somewhere just off a rolling boil should be perfect for brewing your black tea. If your black tea came with specific recommendations for brewing, use those. But using about 2 grams of loose leaf tea per 8 oz. cup of water is a safe bet. Cover your tea while it steeps to keep all the heat in the steeping vessel. Don’t oversteep your tea! The longer your tea steeps, the more quickly it will release any bitterness and astringency. Taste your tea after the recommended steeping time and then decide if you’d like it to steep a little longer. Most high-quality loose leaf black teas can be steeped multiple times. Most black teas are strong enough to stand up to milk and sugar. But to truly enjoy the subtle flavor differences between the many varieties of black tea, try sipping them plain with no additives.